Firm and sweet-tasting tripletail fillets are perfect for pan-roasting and go really well with the savory flavors of Brussels sprouts and baby beets in a roasted garlic and sherry vinegar vinaigrette. 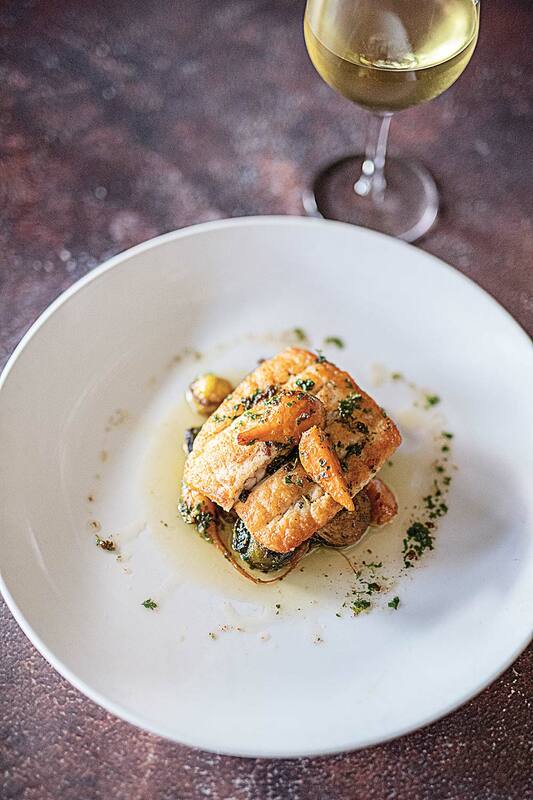 Brown ­butter drizzled over the fish provides the rich, nutty finishing touch that brings it all together. 1. Place beets, thyme and garlic in a rectangular pan (2 to 3 inches deep) with cider vinegar and 1 cup water. Roast in the oven until tender. 2. Pull beets out and cut into quarters, wedged. 1. Halve Brussels sprouts and fry a few at a time in olive oil until crispy. Season with salt and pepper. 1. Halve a garlic head and roast in the oven until brown and tender. 2. Squeeze out the garlic, puree until smooth, and mix with remaining ingredients. 1. Heat oil in a saucepan until lightly smoking, add seasoned tripletail and cook until golden, reduce heat and flip to finish. 2. Spoon butter, thyme and garlic over fish until cooked, then drain on a paper towel. 3. Remove thyme and garlic, then cook remaining butter until it browns slightly and reserve for plating. 1. Heat cooked beets and sprouts with roasted garlic vinaigrette. Add herbs if desired. 2. Plate tripletail atop beets and sprouts, spoon brown butter over it, and finish with coarse sea salt.